Race Friends and Family at our Go-Kart Track! 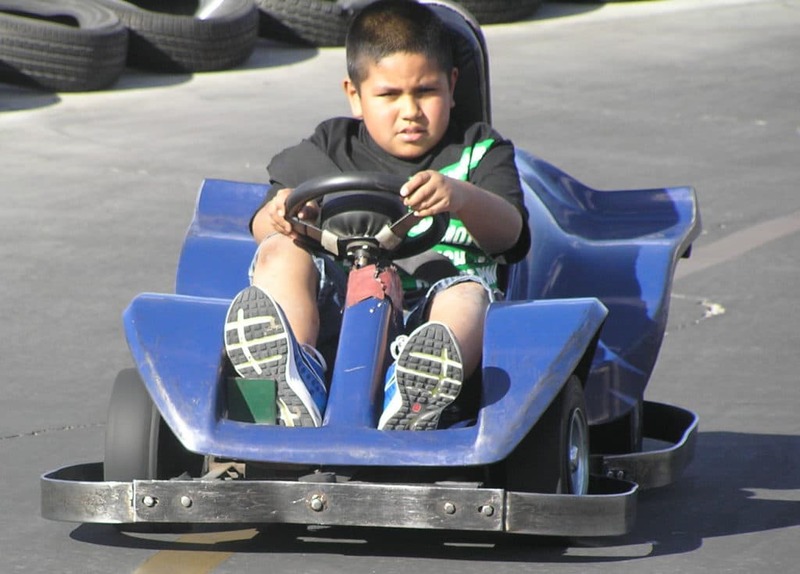 Bob-O’s Family Fun Center is well-known across the El Paso area for its go-kart tracks. Come by, bring your family or friend group and get behind the wheel of our go-karts. Nothing compares to the freedom one feels while zooming past friends and rivals on the track. You can feel like a NASCAR driver or Speed Racer himself! Our go karts provide fun and excitement for people of all ages so bring the entire family! There’s something so cathartic about driving at fast speeds and racing your friends around a wide open go kart track. You can break free from the traffic and feel the win flow through your hair. Nowadays, it seems as if the regular speed limit on the freeway is 20 miles per hour. There’s so much traffic around town that we’re more used to bumper-to-bumper conditions. But when you visit Bob-O’s Family Fun Center, you’ll be able to push the pedal to the metal as you zoom across the track. Our go-karts are great for people of all ages, too. So bring the whole family and see who’s the fastest! Mini Go-Karts: Let The Little Ones Go Crazy! When we say “people of all ages,” we mean it! Bob-o’s Family Fun Center is devoted to providing fun for the entire family, no matter the age. For this reason, we have a mini go-kart track for young children to enjoy! We designed Bob-O’s to provide fun to people of all ages. In fact, it’s our mission for everyone to feel included. The second someone feels left out, the fun ends! So, bring your entire family (yes, even the little ones) and enjoy a race around our go-kart track! Visit Bob-O’s Family Fun Center, Today! At Bob-O’s Family Fun Center, we have something for everyone to enjoy. If go-karts aren’t your particular cup of tea, don’t fret! We have plenty more to offer. From our state-of-the-art arcade and batting cages to our bumper boats and laser tag arena, you’re bound to find one (or a handful) of fun things to do. If you’re planning a family outing, birthday party, or you just want to do something different this weekend, give us a call. We offer excellent group rates so you can just focus on having fun!